Most cats absolutely love wet cat food, but if your cat is addicted to dry, you may have trouble weaning it off of this "junk" food addiction. The simplest way to find out if the switch is going to be a problem is to try using canned cat food as a treat when you are home to see how your cat responds. We found that the smell of the wet cat food was enough for our cat to get very excited! If that works, then gradually increase the amount of canned food and decrease the amount of dry food. What you'll find is that your cat needs less and less dry food as you increase his/her wet food intake. That's because canned food (i.e. the foods listed in this blog) have more protein and fat than the dry food your cat has been eating. The more protein and fat your cat eats, the better nutrition it's receiving and the less it feels hungry. Your cat may not like all textures and flavors of canned cat food, so you may have to experiment. If you buy canned cat food from the lists in this blog, you should have enough variety to figure out what your cat will and won't eat. However, if your cat is a picky eater or really, really addicted to dry cat food, you may have a problem switching to wet cat food. Be sure the canned cat food you choose has meat ingredients. (You can refer to the list of meaty canned cat foods in this blog.) Foods with grains are not only higher in carbohydrates, they are less palatable to your cat. Many cats really like fish-based canned foods. If your cat is one of them, by all means use fish-based canned food as a transitional food. Eventually, you can vary the mix of canned foods by incorporating other meat flavors. Remember, too much mercury-tainted seafood is as bad for your cat as it is for us humans. Try different textures of meat-based canned cat food to see which your cat favors. For example our cat, Raja, is not fond of the mushy "spam"-type of cat food. She prefers food with a chunky texture or with gravy or aspic. If your cat won't eat canned cat food, try adding a meat gravy or meat juice (like tuna juice from human canned tuna) on top of the cat food. Create a sauce-like texture to induce your cat to try the new food. If you (or your cat) prefer, you can mix-in roasted meat. Basically, use any healthy "enhancers" to train your cat to eat wet food. After he/she is used to canned food, you can gradually eliminate your home-made "additives". If your finicky eater still refuses canned cat food, try feeding it meat-based baby food either alone or mixed-into the canned cat food. As mentioned before, you can mix a little dry food into the canned cat food. How much will depend on your cat. After a while, reduce the dry cat food until your cat is only eating wet food. IMPORTANT!! Do not allow your cat to go without eating anything for more than 36 hours! Your cat can develop liver problems if it refuses to eat for that length of time. Even three to four ounces per day of a meat-based food will provide enough protein to avoid such problems. 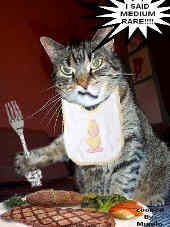 If your cat is eating at least that much, continue with the diet changeover to wet food. Don't take the feeding recommendations on the canned cat food labels too literally. Many say to feed your 14 lb cat 3 3-ounce cans per day. This is not necessarily what your cat wants or needs. I talked to Raja's vet and he said that 2 cans is sufficient for proper nutrition unless your cat is heavier or more active. If your cat seems to want 3 3-ounce cans, then do it. But always consider whether your chubby feline isn't just overeating. To be sure your cat is getting what it needs and no more, it's best to confer with your vet. Our Raja has never been an overeater, so when we switched her to canned cat food about all she could eat was 2 3-ounce cans. Any more would just go to waste. That's the good thing about canned cat food -- Because it's higher in protein, fat and water, your cat fills up faster and stays satisfied longer than with high-carbohydrate, low-protien, low-moisture dry food. So don't be surprised if your cat eats less overall, just be sure it gets enough food. See (6) above and talk to your vet if your cat's appetite drops significantly. We had it easy with Raja as she loves canned cat food and did from day one. If you have other solutions to wean your fat cat off dry cat food, I invite you to leave a comment at the end of this post so other readers of this blog can learn from your success. Thanks! Coming... I'm working on a "cheat sheet" or rather "cheat card" that I can carry with me to the pet store. The card will list only the low-carb brands and flavors that I have researched here. As soon as I have finished the "cheat card", I will make it available for download from this blog.